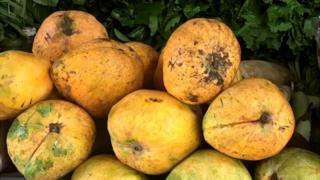 Pipo wey dey torchlight food and medicine mata for Nigeria, wey be di National Agency for Food and Drugs Administration and Control (NAFDAC) say go soon enta fruit markets and supermarkets to check how pipo dey use bad chemical to make fruit ripe. Di madam patapata for di agency, Prof Moji Christianah Adeyeye say dis move dey necessary because di calcium carbide wey dem dey use make fruits ripe, dey cause cancer, heart and kidney failure. Di agency bin don warn Nigerians make dem dey careful as fruits wey dem ripe wit calcium carbide boku for market. "We dey try to do baseline study to sample market for Nigeria and do lab test for di fruits. "Afta dat, we go dey do periodic market testing", she explain. Calcium carbide na chemical and dem dey use am to produce calcium cyanamide wey dem dey use do fertilizer and take weld iron. Di chemical if e touch water, e go come produce acetylene gas wey di help di fruit to ripe sharp-sharp. Even if woman wey get belle chop am, e fit cause miscarriages and oda wahala for di pikin. Nafdac say while di agency dey try chook eye for di mata, say make pipo make sure say dem buy fruits and vegetables from trusted source. Di agency also advise to wash fruits and vegetables well-well.